One of the most common symbols of a funeral procession is the hearse. Today it is a standard piece of equipment needed to transport the casket from the funeral home to the burial site. However, this was not always the case. The first time a hearse on wheels was documented as being used in a funeral procession was in 1648 for the burial of Colonel Rainsborowe during the English Civil War. Later, horse-drawn hearses were known to be in use in New England and the Middle Colony towns before the Revolutionary War. Only wealthy families could afford such extravagant service. From Revolutionary times until the Civil War, domestic carriage makers manufactured hearses on the side. Both the popularity and affordability of hearse drawn services increased after the outbreak of the Civil War. 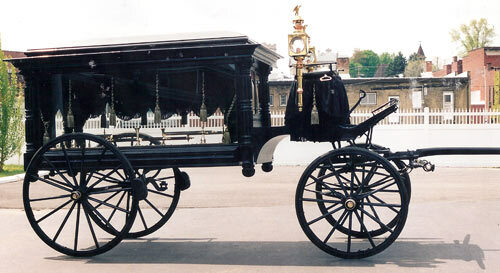 Then as now, fashion and style were important components to society and the design and quality of hearses changed. Deck ornaments replaced the plumes and emblems that were once used, and which originally waved from the top of urns were placed upon the body. Smooth, undecorated tops came into favor for horse drawn hearses. This was about the time that the 1880 Rockfalls Hearse was manufactured in Sterling, Illinois. In the same year, Samuel D. Aultman, the founder of the present day Ferguson Funeral Home, first began his undertaking business in Scottdale. Knowing the horse-drawn hearse was revolutionizing the funeral industry near the end of the 19th century, Samuel acquired one and used it in his services. A hearse of this style continued to be used by Aultman’s predecessors: A. D. Newingham and J. Patrick Owens. They added some elements to the hearse design, such as heavy drapes and tassels along with heavy lamps of gold gilding laden eagles. William Ferguson then entered into partnership with J. Patrick Owens at the turn of the century. 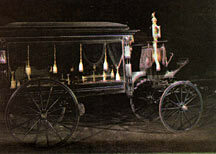 William continued to use a horse-drawn hearse of this style until the start of World War I when the introduction of motorized vehicles made it obsolete. The current owner of Ferguson Funeral Home, Robert B. Ferguson, Jr., is the great grandson of William. In honor of his great grandfather, Rob restored an authentic 1880 Rockfalls horse-drawn hearse and constructed a carriage house in memory of his grandfather in 1999. The carriage house was constructed by famed architect Theodore Charletta of Trafford. 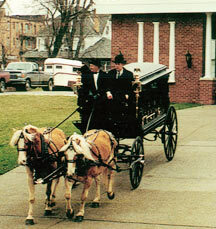 The hearse was restored by Noah Zimmerman, proprietor of the Cove Buggy Shop in Martinsburg, PA. The project was completed for the Scottdale Community Fall Festival and continues to remain a part of the Ferguson Museum. In addition to the hearse and carriage house, Rob also constructed an aggregate gravel driveway that was named “William Ferguson Way” as a tribute to his great grandfather’s legacy. The Rockfalls Hearse is featured each year in the Scottdale Community Fall Festival and is available for use at local cemeteries.